Very pretty, upright girl with good conformation, solid bone and square frame. She has a lovely, expressive face with a delicate wedge shape, dark eyes and good bite. She just looks elegant! 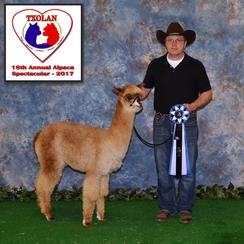 She has the grey genetics combined with the white markings she has bodes well for a grey cria when bred for grey. She is a beautiful, graceful girl, strong and correct her frame. Ellycris is only for sale because we have lots of her siblings and cousins. We cannot keep them all though we really wish we could. She is currently bred to RNC Steel Fox, son of multiple champion Granite Bay Royal Steel and grandson of champion sire of champions, Neversummer's US Steel. 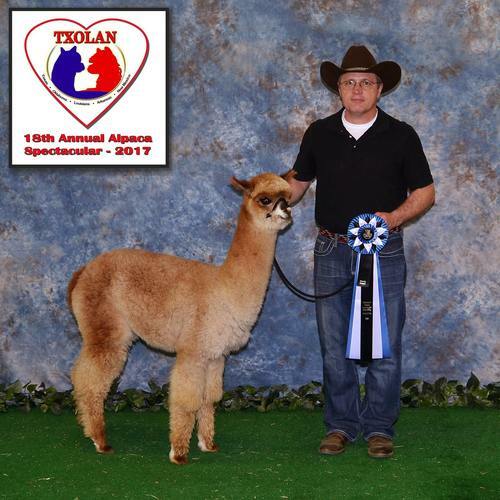 1st - 2017 TXOLAN Spectacular, Juvenile Dark B&O female, Kathy Klay.